"My pictures, they are ruined! 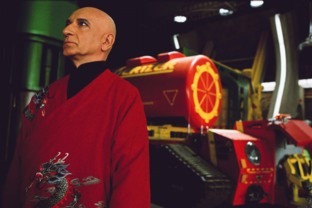 Someone will pay for this…"
The above quote may as well have come from Thunderbirds creator Gerry Anderson. Ever since a trusted industry source told me that Anderson's series was going to be a kiddie picture, I've not been expecting much. Anderson was offered a lot of money just to endorse the film but he stuck to his guns and is now widely quoted in the press as being a 'pain in the arse' (an opinion from a 'representative of the company Working Title'). I'd be a pain in the arse if there were nothing I could do to ensure that a creation of mine (that continues to touch millions) wasn't being demographed into homogenous pap. Anderson did sell his rights to the series though. How the man must regret that little transaction. If he'd been in on the profit shares from Tracy Island's sales alone, he could afford a paradise island of his own by now. Did Star Trek's No. 1, Jonathan Frakes, have a good time on the set of his version of Thunderbirds? Press puffery would have you believe so. So why is Lady Penelope reading the Financial Times (it’s pink, naturally) with the headline "Directors Under Fire" – a nice detail in a film with many nice details but an astonishingly, limb achingly, trite plot. In the TV series, it was sometimes necessary for the directors to make a plot point or tease suspense with a close up (button pressing, switch clicking etc.). When your cast are 13" wooden puppets, this is a mite inconvenient. So the directors resorted to the easy option – live action hand doubles. It always brought me up short as a child watching Thunderbirds. Where did that real life hand come from? Are they trying to tell me that we're supposed to believe the puppets are real? So how does Jonathan Frakes nod to his film's television past? In the prep for a launch, there is a close up of a lever being activated – by a wooden hand complete with very obvious strings. You have to be sharp to catch it. The shot is barely two seconds long but it's an affectionate nod before the charm and attraction of the series is bulldozed flat by Hollywood corporate expectation. Can you imagine the pre-production meetings at the studio? Demographics are go! Kim Newman in Sight and Sound said that Thun derbirds was like Die Hard made by the Children's Film Foundation. I wish I'd said that. It's a perfect description if a little less than flattering to Die Hard. It's also a very odd movie, comparisons to the original series notwithstanding (though those are bound to come up). It does have its moments but the story is so ill judged to transfer the appeal of the TV show to the big screen that it feels like the Thunderbird craft are add-ons when they really should be centre stage (but hell, CG's expensive enough). Model FX, RIP. We will miss you. We don't even get a 'how they get to the craft' sequence. In fact, the Thunderbird craft are not even revealed. They are already at a rescue site at night so you never get a good look at them. The second chance at the first impression doesn't do the business. The story is a coming of age tale where headstrong Alan (the youngest Tracy brother, a teenager, demographics are go!) is determined to become a Thunderbird pilot but feels his father is holding him back. Alan, of course, saves the day. Yeah, same old, same old. But we know all this. It's the journey taken to the obvious conclusion that’s supposed to be the entertainment. Well, Thunderbirds is a real oddity, set in a mish-mash, colourful, retro-plastic future in which Hugh Grant's hairstyle in About a Boy isn't so much emulated as worshipped and built upon. The Tracy family members are so clean cut, they are, en masse, entirely bloodless. One brother stands out (the unpopular one, John, who lives on the space station, Thunderbird 5) because he's the spittin’ image of Rik Mayall with a silver coiffure. But his siblings are like one big white suited splodge headed by Bill Paxton. Every time any one of them smiles I feel like I’m eating chalk. The all-American dental sincerity really grates after a nano-second (or two). Everyone has the de rigeur backstory (Jeff's wife died in an accident so he starts up International Rescue to save people – as you do). The villain's brother was saved by International Rescue but the villain was left to die so becomes the villain etc. I mean the Hood wants to rob a bank… Oh dear. It's like "Enough, where's Virgil going down the chute?" But his erstwhile, gorgeous, giant, green pod carrier only ever does the palm tree thing once and it's being piloted by the bad guys! C'mon. The re-design of the craft is not cataclysmically bad (1 and 3 are recognisably rockets), 2 gets a wings pushed back makeover and 4 is re-jigged quite dramatically but as we don't get to see a great deal of rescuing, the craft are moot. Can the teenage Alan defeat the Hood with the help of his pet scientist Fermat (s-s-stuttering son of Brains) and the plucky Tin-Tin (daughter of Kyrano, the housekeeper)? Well, whaddya think? An aside for the sake of accuracy. In one of the very best Star Treks, The Corbomite Manouevre, a very powerful alien being talks to the crew of the Enterprise. He identifies himself as 'Balok' as in 'Bay Lock'. Later, McCoy comes to the bridge and announces that Balok's message was heard all over the ship. But McCoy says 'Baa Lik'. It's an annoying discrepancy that probably led to pronunciation guides at the header page of each new Trek script. Well, Kyrano (Kii Rar No) is pronounced at least three different ways in the film. And what is it with the definite article? The term International Rescue (a staple phrase in the TV series) is all but abandoned. It's 'The Thunderbirds, this' and 'The Thunderbirds, that' as if the teenage audience was sitting there saying "I wish I could remember the name of this movie…" Even the pilots call themselves 'Thunderbirds' but then 'Thunderblokes' probably sounds too hokey. So what about the token female? An absolute joy. Part of my brain shut down in the sixties when any Thunderbird story depended too heavily on Lady Penelope. But the movie incarnation is so playfully and confidently owned by Sophia Myles that I felt she may have walked away with the movie if anyone had any sense. I mean this woman walks into an all-male school and announces "Hullo boys!" with real predatory glee and aside from that indirect reference to the Wonder Bra poster, there is even a direct reference as she slips out a small metal strip cup support from her own undergarments cheerfully informing all that "I don’t really need it," and you believe her. Her own Parker, Ron Cook, is all dour and correct and delivers the literal punch-line of the biggest laugh in the movie. That it's preceded by a kick in the balls (a child's only real defence strategy) is a testament to its effectiveness. Equally badly miscast is Anthony Edwards who is required at one point to walk like a puppet under the Hood's control. Ha ha but no. It just looks like bad acting. Edwards is a good actor but as Brains, he is trying to emulate a performance 40 years old and by an actor made of oak. The joke of the stuttered word being replaced by another less obvious one wears thin after the 2nd time (it's done about 15 times) so Brains is little more than a cipher father figure to his more resourceful offspring, Fermat.